Lots of things happening over here, people! Firstly, my nails are painted a color called “marshmallow.” Clearly, good things, they are happening. There are new projects to think about, bright yellow sneakers to wear, picnics to be eaten at the beach, and cross-country flights to take for the 4th of July. My head is excited. So let’s celebrate and get patriotic with this thing. What’s more American than a brownie? I mean, besides Tim Tebow and pie and manifest destiny and stuff. Brownies! Maybe we’ll bake them up in a tart pan, and infuse them with fresh raspberry. And if we pile them high with fluffy, white whipped cream and bright red and blue berries, well, then we do our forefathers proud. Here’s looking at you, Thomas Jefferson. Happy Independence Day, Amurica! I made you a brownie. You feel like home to me. You have your issues, but really, who doesn’t? On the whole, I think you’re pretty wonderful. Covered with berries and cream. I like the way this looks baked in a tart pan and cut into wedges for serving, but if you don’t have a tart pan, feel free to just use a regular 8×8 brownie pan, instead. 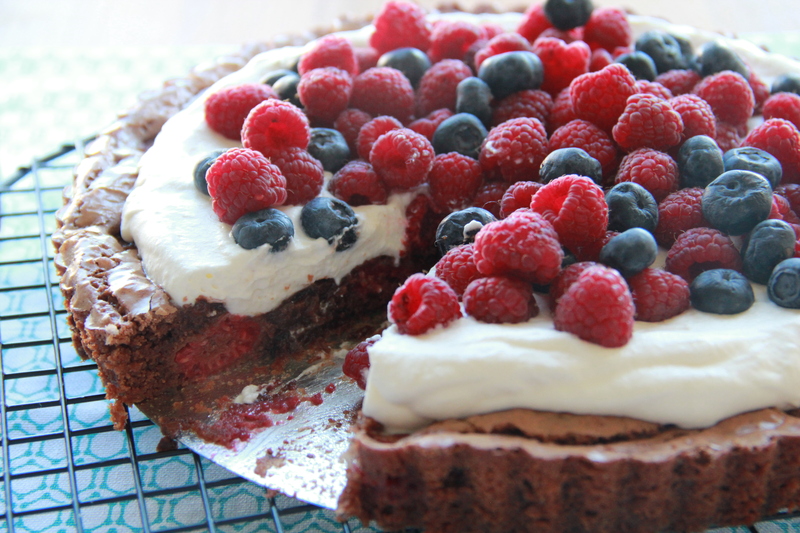 This will travel well to a picnic or barbecue; just leave off the berries to start and transport them in a separate container, and then toss them on the cream covered brownie just before serving. Enjoy! Preheat the oven to 350 degrees F. Grease and flour an 8-inch pie or tart pan. In a small bowl, whisk together the flour, baking powder, and salt, and set aside. In a medium saucepan, melt the butter over a low flame. Once melted, remove from heat and add the bittersweet chocolate, stirring with a rubber spatula until fully melted. Whisk in the sugar, eggs, yolks, and vanilla. Add the flour mixture, all at once, and stir to combine. 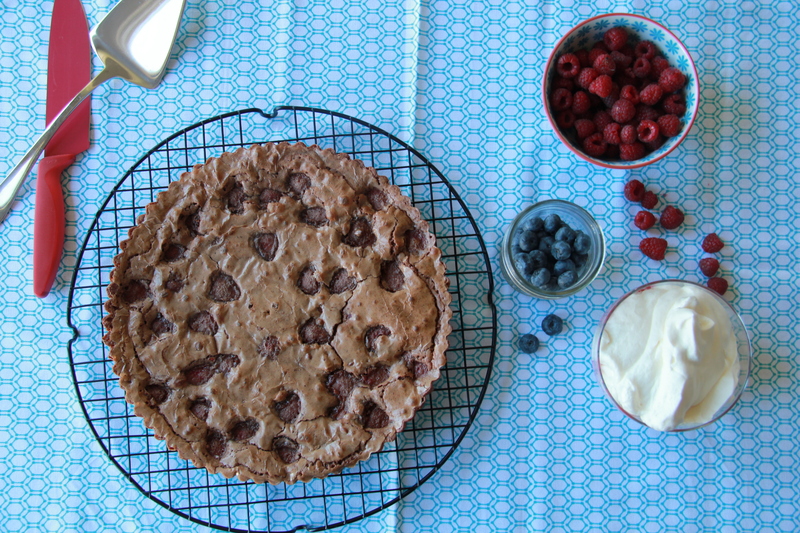 Fold in the chocolate chips, then fresh raspberries (or jam, if using). Pour the brownie batter into the prepared dish and bake for 30-35 minutes, until a skewer inserted in the center comes out clean. Cool on a wire rack. 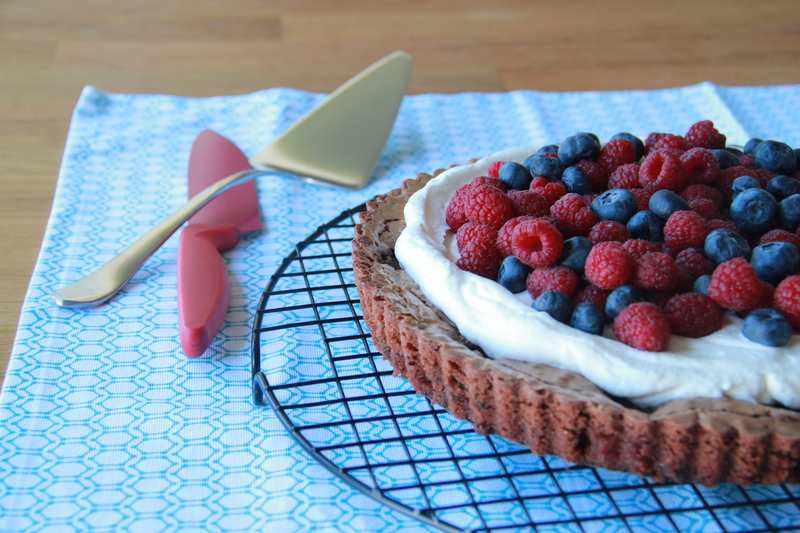 Spread the whipped cream onto the cooled brownie (an offset spatula works nicely here). 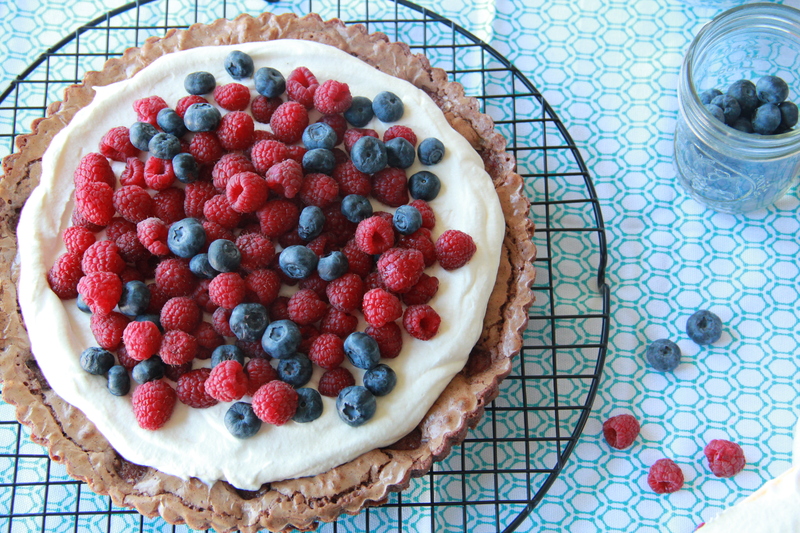 Scatter berries atop soft cream, and serve as soon as possible. By itself, the brownie will last, well wrapped, for about three days. 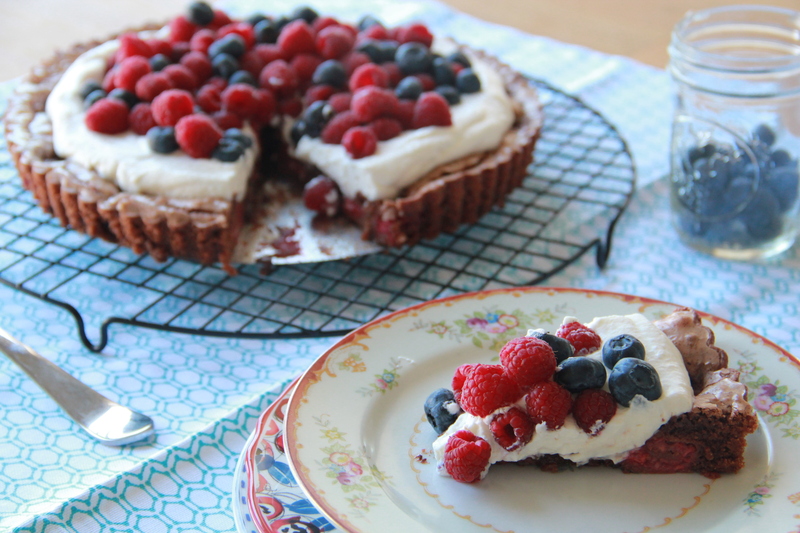 Once the whipped cream and berries are added, however, the tart becomes much more delicate, and is best enjoyed on the same day. I love your blog. Love. Like, too much. Like, want to leave work to go make this-style love. looks BEYOND delicious, chef molly! will have to hold off making this till i get my kitchen back though! Have a fantastic time – and give everyone my love! Ummmm.. yum? Also- I think marshmallow nail-polish can only mean good things. I want it. It’s time for a new post. The people are hungry. I *love* that you managed to combine chocolate baked goods, whipped cream, Tim Tebow and America in the same post. You’ve hooked me.